The 707 Community Park (707CP) is centrally located within the western half of Gabriola island, approximately 2km southeast of the ferry terminal. This 707 acre (286 hectare) park is currently the second largest park in the Regional District of Nanaimo's park system and is the largest park on Gabriola Island. The 707CP was created in 2005 after the Gabriola Island Local Trust Committee (LTC) approved a bylaw that permitted the transfer of 35 residential densities from 286 hectares (707 acres) of forest-zoned lands and rezoned the land for Forestry-Wilderness Recreational Use. The land was then transferred to the Regional District of Nanaimo on a free-hold basis for the purposes of Community Park use in Electoral Area 'B'. Before RDN acquisition, the 707CP lands had been actively logged since 1953, with the most extensive logging occurring from 1996-2005. Even before its designation as a community park, the 707CP lands provided quality passive wilderness recreation and education. 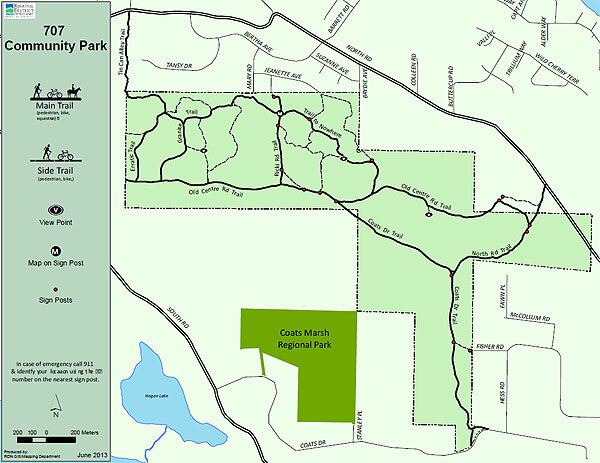 For information on the 707 Community Park Management Plan, please click here.